SharpCap Max Memory – SharpCap – Lunar, Planetary, Solar and Deep Sky Imaging. EAA and Live Stacking. This new approach to memory management allows SharpCap to access considerably more system memory if it is available. This reduces the chance of running out of memory when working with high resolutions and allows SharpCap to cache many frames in memory when performing high speed captures (if the Hard Disk can’t keep up). This feature is only available to users who have 64 bit versions of Windows and at least 4Gb of total system memory. 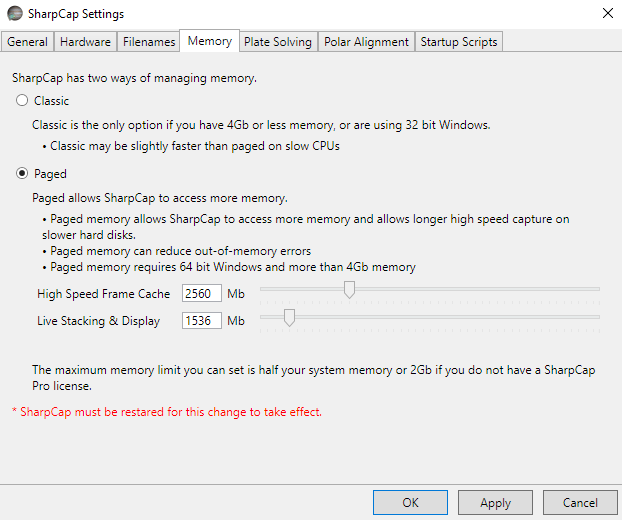 SharpCap Pro users can allocate up to 50% of their system memory to this feature, so if you have 16Gb of memory you could allocate 8Gb, which would allow SharpCap to cache nearly 6000 1280x1024xRAW8 frames in memory waiting to be written to disk! Non SharpCap Pro users can only allocate 2Gb to this feature, but that still gives a cache of 800+ frames available. The allocated memory needs to be split between high speed imaging frame cache and memory for other tasks such as live stacking on high resolution cameras. Configure Max Memory settings in the ‘Memory’ tab of the SharpCap settings.